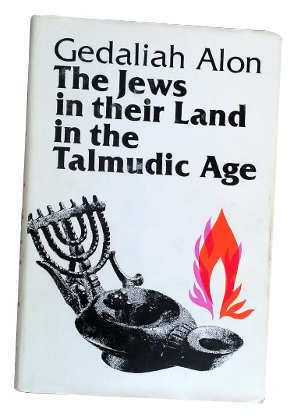 The late Hebrew University of Jerusalem professor, Gedaliah Alon, offers one of the best opinions in the book, The Jews in their Land in the Talmudic Age. Gedaliah Alon is not a household name when it comes to North American religious discussions, so a little background is required. Mr. Alon was a revered historian and the initial winner of the Israel Prize for Jewish Studies. 1 He had an unrivalled commitment to detail, multidisciplined resourcing of historical texts, and ability to structure them into cohesive sense. Although he died in 1950, his contributions to the fields of first-century Judaism and to a lesser extent, Christianity, are substantial. He wrote that there were two factors and a later final decision by a Jewish authority around 80 AD that led to the early followers of Jesus to become disenfranchised from their Jewish parent. But there were two factors that caused the atmosphere to change radically. The first was that, in moments of national crisis, the Jewish Christians turned their backs on the national cause of the Jewish people. In a report relayed by Eusebius, Hegessipus tells us how the Mother Church in Jerusalem left the besieged city in the year 68, and went to Pella. And again, when the battle-lines were drawn against the Roman occupation in the Bar Kokhba Revolt, the Jewish Christians refused to identify with the Jewish side. Pella was a city slightly east of the Jordan river. It is located today in the country of Jordan, about 130 km north of Jordan’s capital city, Amman. The first evidence that the “Jewish Christians turned their backs” is a very credible one. The statement from Eusebius further enforces this fact. There are vestiges of this idea in Origen’s Against Celsius I:47 and II:13 but I don’t consider these very strong citations. Indeed, the first Jewish war against Rome in AD 70 led to the destruction of the Temple, servitude and deportation of Jews to foreign countries. The conditions within the walls of Jerusalem by those revolting or caught in the revolt were deplorable. The ancient Roman-Jewish historian, Josephus, chronicles this in his work, The War of the Jews. Alon stated that the Jewish Christians then later refused to side with the Jewish resistance in the Bar Kochba revolt. This uprising occurred between 132–136 AD and was crushed by Rome under the leadership of Hadrian. This war significantly changed the geographic identity of the Middle East and made the Jewish race stateless for the next 2000 years. There are two factors that would make these two parties working together against the Romans almost impossible. The animosity that the nationalist Jews held against Jewish Christians and maybe vice versa, and the apocalyptic views of the Jewish Christians. From the data available today, it demonstrates that the Jewish Christians did not participate in the Bar Kochba revolt. This moment was a significant contributor to the break between the two parties. This assertion by Alon about a legislative ruling against Jewish Christians is intriguing and perhaps overhyped. Some background is required before proceeding. After the destruction of Jerusalem, a new form of Jewish leadership arose and formed its Roman-sanctioned base in a place south of Tel-Aviv called Yavneh. 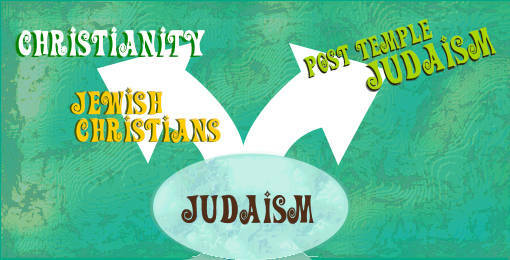 Here is where post-Temple Judaism shaped its new identity. The first leader was Johanan ben Zakkai who later was followed by Rabban Gamaliel II. Gedaliah Alon blames Gamaliel II on the severance between established Judaism and its fledgling. The strength of Alon’s assertion falls on an ancient Jewish custom of reciting a specific prayer called the Amida. The Amida is a prayer formula originally containing 18 benedictions with one more added later to make it 19. Which one out the 19 was last added? We are not sure today. The prayer existed before the fall of the Temple but lacked uniformity. Gamaliel II standardized the Amida and modified it to exclude Jewish Christians. It is the use of the 12th here that Alon is taking aim and gives credence for such a bold statement. All we really know about the creation of this 12th benediction is a single Talmudic text; Talmud Bavli Berakoth 28b. The understanding of minim refers to Jewish Christians. Some believe it was aimed at Sadducees while others that it was towards any group that was deviant to standard Judaism.10 Alon was well aware of the different interpretations and copiously demonstrated through other Talmudic citations, early Christian literature, and especially the Cairo Geniza that it was directed towards Jewish Christians. The Cairo Geniza, if considered the correct version, builds a portrait where those who chose the life of a Messianic Jew were stripped of their Jewish identity. This set the stage for a complete severance. However, there is still more to ponder. Alon cites numerous examples demonstrating a complete ostracism with Jewish Christians—talking with one, touching, reading or even disposing their literature was considered a sin. The case for excommunication and the rise of Christianity is very evident from Alon’s thesis. However, the remarks are all situated in Israel major or regions close by. For regions further outside of Israel, there was a different kind of relationship. The third century takes us to Alexandria, Egypt, and then later to Caesarea, Palestine, where one of the most pious and intelligent Christians, Origen, lived, studied and breathed. He had considerable warm relations with the Jewish community. This type of relationship was demonstrative of the period. So much so, that in the fourth century the great Christian orator, John Chrysostom, whose homilies modern historians liberally quote, took aim against Judaism as a threat against his flock. His attack was in response to his followers vacillating attendance between Jewish institutions and his Church. Chrysostom took great lengths to attack Jews and their structures to sever such an affiliation. His vitriol results in one of the worst examples of high profile Christian anti-semitism. The close relationship was also concerning to the Christian-dominated Roman Government led by Constantine early in the fourth century. He made a decree that ended any official interchange between Christians and Jews on the scheduling of Easter. The wording suggests that it had an impact on the greater relations between the two parties. For more information on this topic, see Anti-Semitism in the Ancient Church which focuses on Church, Jewish and pagan relations up until the 8th century. The only information we have on the ethnic makeup is a second century anonymous text covering II Corinthians. This text claims that the Greek adherents had formally overtaken the Jewish ones by this time.16 One can reasonably assume the majority makeup of the earliest assembly previous to this was those of a Jewish descent. The information gleaned from all the sources shown so far demonstrates Judaism was part of the core identity of the earliest gatherings of the assembly. What should we call the earliest Christians? Paul uses the word the Way to describe the movement,20 which underlies a more Middle Eastern perception while Christian has a more Western Greek influence. Paul never uses the term Christian in any of his documents. Paul, along with all the New Testament texts, never describe any local Jewish Christian institution as a synagogue either. The term ecclesia ἐκκλησία is typically translated as Church or assembly into English. Ecclesia was Paul’s preference when addressing any organization that involved his leadership. This word, however, had a different meaning to Paul than our understanding. The word ecclesia has important underpinnings in the Mosaic assembly and implications on the Dead Sea Scroll groups. This etymology is not well represented in popular English translations. The understanding of ecclesia in Paul’s writings is in development. It is in an upcoming article, Paul and the Synagogue. Gedaliah Alon liked to refer to the earliest members of this movement as Jewish Christians. It is an awkward title that I grudgingly use for consistency throughout this document. Ancient Jews referred to them as Nazarenes, or more harshly, Minim (separates or heretics). Messianic Jews is closer to the earliest state, but this can easily connect with the current Messianic Jewish movement happening in pockets globally. These are two different entities so it should be done with caution, though I use it infrequently where Jewish Christian is too repetitive. Restorationist Judaism is another good qualifier because the earliest adoptees of Christ saw this event as restoring and completing Judaism. However, restorationist has a whole set of dynamics that would easily entangle one in semantics for a long time. Jewish Christians has to be used for want of a better term. The separation and distinct identity of what would later be called Christianity did not happen until after 80 AD. Any New Testament studies before this period must approach the pre-80 era first as a Judaic sect that had admixtures of Hebrew, Greek, and Aramaic. This mixture likely existed into the first quarter of the second century too, but conservatively, 80 AD holds true. An approach of the New Testament from a sole Greek perspective leaves the researcher with vacuous holes and extra energy to find connections through classical Greek literature. Many results are inconclusive and lead to conjecture. This problem is especially apparent in the rites of speaking and praying in tongues—there are little antecedents in Greek literature, while there is much more available in Jewish ones. One must exercise caution with this conclusion about 80 AD. The Jewish Christian community never reciprocated the same exclusion. Christian records show a mixed network of affiliation between the two parties that caused problems within Church leadership. Exclusion from the Christian perspective happened later. The total separation was gradual and finalized around the fourth century when the Roman Emperor Constantine introduced Christianity as a tolerated (though not official) religion of the Roman Empire. Ecclesiastical History by Eusebius. Book III, Chapter 5. See Jewish Followers of Jesus and the Bar Kokhba Revolt: Re-examing the Christian Sources for further information. See Megilah 17 to 18 for more details. Gedaliah Alon. The Jews in their Land in the Talmudic Age. Translated and edited by Gershon Levi. Vol. 1. Jerusalem: The Magnes Press. 1980. Pg. 289. There is also a second version on this page that is very similar. I have not included it for the sake of brevity. Thanks Charles for your work and passion I very much enjoy testing the origins of Christianity and try to work through the influences of Greek and Aristotle and Plato upon interpretation and translation of scripture and then to compare it to Hebrew thought and testing it against scripture as close to its historical delivery and culture as possible it certainly realigns what I thought to be true of English Greek only translation and the associated “ doctrines” or even way of thinking., Hebrew thought and Greek thought are very different and you can arrive at very different conclusions. Many thanks for your work.